"Murillo was favored by Heaven not only in the eminence of his ability but also in his natural endowments; he had a good figure and an amiable disposition and was humble and modest so that he did not disdain to accept correction from anyone." In Baroque Spain, artists were more than painters or sculptors, in the eyes of the faithful, they had the power to make the sacred real; and in Seville, Bartolomé Esteban Murillo was known as the greatest religious painter of his age. He developed a lush, illusionistic, yet accessible style that combined his grasp of the sensual world with religious conviction and respect for narrative clarity. So, whether his subject was sacred or secular, he painted convincing human beings with recognizable emotions. Murillo's pictures of street children captured their raw energy and brio, while his religious paintings held a mirror up to people and encouraged them to recognise their best qualities, so that they might strive for them in daily life. Like any good artist, he was a storyteller, and like any good storyteller, he painted to show, not tell. His elegant images of the Immaculate Conception, and his reinterpretations of the Virgin, Christ, and saints as beautiful children, blended realism and otherworldliness to immensely popular effect. Even into the 19th century, his paintings of children remained highly prized by English and French collectors, and inspired works by Thomas Gainsborough, Sir Joshua Reynolds and Jean-Baptiste Greuze. Murillo painted Christ, the Virgin and Saint John the Baptist as beautiful children to inspire empathy and by extension, charity. Such an emotional approach to religious painting was unprecedented in Spanish art, and with the exception of Murillo's many followers, does not reappear until the late 18th century, in the work of Francisco Goya. Murillo enlivened and simplified traditional subject matter - religious or otherwise - by using local models, and replacing attributes with dramatic poses and gestures, painting stories and lessons in a visual language ordinary people could comprehend. Murillo was fascinated by boundaries and challenged the idea that a viewer's engagement with a painting stops at its surface. He used foreshortening, shallow foregrounds, and trompe l'oeil details to literally "fool the eye" and draw viewers deeper into his images. 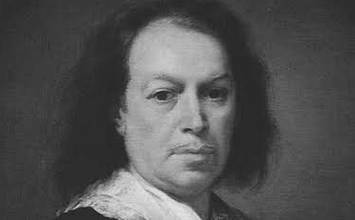 In December 1617, Bartolomé Esteban Murillo was born in Seville, where he would live and work his entire life. Throughout his childhood, Seville remained the foremost city in Spain, equal in power and population to Venice, Amsterdam, or even Madrid. Seville had long held the monopoly on trade with the New World, and despite Spain's near constant wars with France and the Low Countries, the city remained prosperous well into the 1630s. Later, when Murillo established his career, Seville's population and standard of living decreased, while its churches and religious fraternities increased. Eventually, his identity became integrated so strongly with religion that his pictures arguably shaped Baroque Seville as much as the city moulded his career. The Young Beggar was widely admired for its realism and is one of the finest examples of a subject effectively unique to Murillo: vignettes of local street children. Alternately known as Boy Delousing Himself or The Lice-Ridden Boy, these variations may have related to Andalusian folk wisdom which believed children with lice to be healthy and happy, because lice could not live on sick children. Here, as in similar pictures, most of which Murillo painted in the 1670s, his setting is only the barest suggestion of a room. He arranged the boy close to the picture plane (the child's dirty feet practically point at the viewer) and reserved only a shallow foreground to include the scattering of shellfish casings and bag of apples that hint at the boy's hunger and hardscrabble life. This level of realism would not have appealed to local collectors; Murillo actually painted these images specifically for his foreign market: the Genoese, Dutch and Flemish merchants who traded out of Seville's port on the river Guadalquivir. Although the picture is neither signed nor dated, scholars agree Murillo painted it around 1645, when he was still influenced by Zurbarán and Velázquez. Murillo's sombre palette, volumetric forms and impasto brushwork recall genre subjects Velázquez painted before he left for Madrid, such as The Water-Seller of Seville (1620). Also, Murillo was known to share the current taste for picaresque literature, and his images of street children may have been informed by Miguel de Cervantès. Since the early 19th century, the painting has been in the Louvre, where it influenced Realist painters, including François Bonvin, Gustave Courbet, and Édouard Manet (who actually copied it). While The Young Beggar might appear at odds with Murillo's religious imagery, examined in context of his sympathy for the poor and his dedication to charity, it emerges as not only one of his most striking paintings, but also one of his most empathetic. Around 1644, Murillo won his first major commission from the Convento de San Francisco in Seville to paint thirteen canvases depicting various miracles and ecstasies associated with the order's friars and saints. One of the very few paintings Murillo signed and dated, The Angel's Kitchen possibly illustrates a vision of Saint Giles of Assisi, who, in 1212, made a pilgrimage to Santiago de Compostela en route to Jerusalem. Giles, one of Saint Francis' first companions, was not particularly learned or articulate, but he was utterly committed to a life of poverty and pilgrimage. He wore a second-hand habit and lived as a nomad, earning his keep by doing odd jobs for any church or monastery that gave him food and shelter. Set in a space based on the Convento's actual kitchen, Murillo painted the saint twice. Giles first appears deep in spiritual ecstasy, floating in a nimbus. The Convento's Father Superior and two gentlemen (perhaps donors) look on in amazement. Then Giles appears again, at right, grounded and looking spellbound at a group of angels and cherubs, who variously prepare food, grind spices, wash pots and set the table. Every detail of the food, tools and kitchenware is tangibly present and injects a sense of reality into the scene that highlights an amusing fact: the divine helpers are actually doing Giles's work for him. In the middle of the canvas, two large angels punctuate the two scenes marking their existential difference (i.e. Giles's vision, and the angels' hard work). At the angel's feet a plinth notes a friar named Francisco, suggesting that perhaps Murillo based Giles on the Convento's cook, Francisco Perez, who was known for his piety. The series as a whole, and The Angel's Kitchen in particular are masterpieces of Murillo's early style, which features graceful figures, realistic details, and a distinct spatial divide between reality and the spiritual world. Eleven of the original thirteen canvases survived the Spanish War of Independence (1808-14). But four of these were stolen and dispersed, including the present work, to France. The Convento was demolished in 1841. Also known as The Virgin of the Escorial, this is arguably Murillo's finest Virgin and Child. A relatively early painting, it incorporates the strong chiaroscuro inspired by Caravaggio that endured in Spanish art well into the 17th century. Murillo would have known Caravaggio's paintings from prints, copies or possibly original works in local collections. However, this Virgin of the Rosary has a delicacy and sweetness atypical of Caravaggio's work, and curator Jane Martineau has argued that Murillo was inspired by the work of Bartoloméo Cavarozzi, an Italian who worked in Madrid, and whose paintings were widely known in Spain. If Caravozzi and Murillo painted similar Virgins, that may also have been due to their shared admiration of Raphael's Virgins, which Murillo would have known from drawings and engravings after the Renaissance master circulated throughout the local studios and workshops. Initially, as in much of his early work, Murillo strived for a sculptural effect in his figures, and he particularly admired the monumentality of Raphael's Virgins. By 1650, however, Murillo introduced a new elegance into his style, and painted the Virgin as younger, more delicately featured, with feathery brushwork possibly borrowed from Anthony Van Dyck, whose paintings were known in Seville. Likewise, in the present work, the Christ Child is no longer a languid baby, but an active toddler, who plays with a rosary entwined in the Virgin's hand. The beads formally unite the Child and the Virgin and their cheek-to-cheek embrace imparts a sense of tenderness that is deeply empathetic. This shift in pose also changed the overall composition, making it necessarily more vertical, allowing Murillo space to paint luxurious draperies in sweeping brushstrokes of glowing, jewel-like color. In 1644, Murillo joined the Brotherhood of the Virgin of the Rosary, a lay fraternity dedicated to the Virgin Mary. Murillo possibly painted this Virgin of the Rosary for a private collector associated with the Brotherhood. It only entered the royal collections in the Escorial in 1788, before eventually passing to the Prado in 1827. However, the painting was always popular and well known, and it was copied by several accomplished painters. One copy in the Wallace Collection was apparently so good, it was long believed to be by Murilllo. One of the few genre paintings that does not include children, Two Women at a Window was also one of Murillo's most widely celebrated; it was engraved several times during the 18th and 19th centuries. Strictly speaking, genre paintings were rare in Spanish Baroque art. During the 17th century, similar subjects were far more popular in the Low Countries, and for this reason, it is generally held that Murillo painted these pictures for the Dutch and Flemish merchants who traded out of Seville's port. One of these merchants, Nicolás Omazur was believed to own a copy of the present work, but this may have been a copy Murillo made after another similar painting. Murillo's window-sill composition and trompe l'oeil effect were unprecedented in Spanish painting, but characteristic of contemporary Dutch paintings, notably by Rembrandt. Are the two women maids, a young woman of good family and her duenna, a prostitute and her procuress? A late eighteenth-century engraving after the painting was published as Las Gallegas (The Galician Women), and women from Galicia came to Seville to work as domestic servants (or prostitutes). Without pronouncing either way, the late art historian Diego Angulo Íñiguez noted an old Spanish adage that said a woman at a window spelled sexual opportunity (much like a modern red light). However, both women are young, which would be inappropriate for a prostitute and her procuress. Finally, there is Murillo's ambiguous setting. Only the lip of the window ledge is original. The area below is a later addition and it is not clear, even from later engravings, what he originally intended. More to the point, as curator Xavier Bray pointed out, Murillo was fascinated by boundaries. Whether his subject was sacred or secular, he loved to subvert the idea that the viewer's experience of a painting is limited in any way by the physical fact of its surface. In the present picture, he painted two pretty, healthy girls in a plain, innocuous setting and included no background, nor any distracting details. In fact, he made the girls' presence so immediate, they almost seem to encroach on the viewer's physical space, an effect lightened by their smiles and direct eye contact, making this particular work a triumph of illusionism, and possibly even wish-fulfilment. This vast canvas marked a pivotal point in Murillo's career, establishing his name as one of premier religious painters in Seville. Completed in 1656, the painting is still in its original location: the baptismal chapel of Santa María de la Sede, Seville's cathedral. The picture is difficult to view, due to its size, the lack of available light, and the fact that visitors need to peer over the baptismal font from behind a stanchion to see it. Nevertheless, even today - while other versions of this popular subject can appear whimsical or saccharine - Murillo's interpretation of the saint's dream still inspires a sense of frozen awe. An early example of Murillo's so-called "vaporous style" that combined golden tonal color with diffused form, it is possible, as some have argued, that he was inspired by Venetian painting, or works by Herrera the Younger. However, neither would explain what compelled Murillo to pair realism (the furniture and floor are typical of local décor) with the subtle sensitivity of gesture and expression in painting this serenely supernatural image. Contemporary critic Fernando de la Torre Farfán wrote that Murillo painted even the saint's desk "with such art that there are those who testify to having seen a bird labouring to sit on it so as to peck at the white lilies there are in a vase". Today, this reads as hyperbole, but the painting won Murillo a further string of religious commissions and is now acknowledged as a masterpiece of his mature period; as art historian Jonathan Brown wrote, it was Murillo's "first essay in the high baroque". Born in medieval Lisbon, Anthony opted first for a life of prayer, but soon his ambitions turned to martyrdom. En route to Morocco, where he planned to convert Saracens, his ship foundered off Sicily, so instead he roamed Italy as a preacher. One evening while praying in his cell, he saw the Infant Christ floating in a cloud of golden light with cherubim, a vision whose obvious appeal did not go unnoticed by the Counter-Reformation Church. Anthony also became known as the patron saint of lost property, an identity that became particularly resonant in 1874, when thieves cut out most of the lower right section of the painting. About a year later, the remnant re-appeared in New York, where a picture dealer recognized it, bought it and turned it over to the Spanish consulate. The stolen section was returned to Seville, and following careful restoration, the entire painting was reinstalled in the Cathedral. Placed in a nominally classical setting, made intimate by his typically shallow composition, in The Good Shepherd, Murillo has combined his gift for painting children, with an almost Rococo palette, and a limpid, silver sense of light to create images that expressed both spiritual divinity and human vulnerability. The Infant Shepherd's idealised beauty is the antithesis of Murillo's street children, but he maintained a sense of naturalism in the child's casual embrace of the lamb, and its woolly fleece. Also, seizing on the fact that children with domestic animals were a common sight in Seville, Murillo knew the lamb could carry a double meaning: as the Child's pet and as His fate as the Lamb of God, allowing him to illustrate a sacred subject in the context of everyday life, therefore broadening its appeal. Even considering his success as a religious painter, Murillo's images of the Infant Christ and the Infant Saint John the Baptist were remarkably sought after by both Spanish and foreign collectors. Not only did these pictures have obvious decorative appeal and hung well in the luxurious interiors of the wealthy and devout, but they were ideal for private chapels. In Seville, Murillo sold many of these paintings to his main patrons, Don Justino de Neve and Nicolás Omazur, but they were also coveted by English collectors, such as Joseph Townsend, who wrote that during his travels in Spain he did not find works by any other artist that "equalled [Murillo] in expression and sweetness". In fact, for a time, Murillo's work was far more famous in England than in Spain, and its presence in British collections later inspired paintings by Gainsborough, Reynolds and Greuze. The charm of these paintings and their call to human emotion helped make complex theological concepts accessible and gave these images a mass appeal that endures; they are still some of most widely reproduced artworks in the Catholic Church. Murillo became so famous as a religious painter that for many years his work as a portraitist was relatively unexamined. 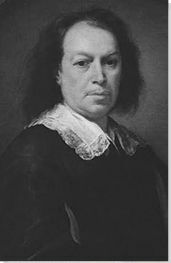 However, his portrait of Don Justino de Neve was, even in Murillo's lifetime, held to be a masterpiece, in fact, one of the greatest portraits of its time. Painted as a gift, as thanks for helping Murillo secure major commissions, the portrait shows Don Justino - Canon of Seville Cathedral - seated in his study, a room that appears to open onto a terraced garden. This inside-outside situation was typical of Roman religious portraiture, and usually symbolized the challenges of living a religious life in the secular world. However, Murillo also used this formula to intensify his likeness of Don Justino. The garden's silvery grey-greens throw warmer areas - the red chair, terracotta floor, the golden clock, and the dog's red ribbon - into high relief. And instead of dressing Don Justino - who was below average height - in elaborate robes to make him appear more substantial, Murillo painted him in a simple cassock, known as a baladran, which offsets his elegant hands and handsome face; both appear almost sculptural against the thick black material. This focus also emphasises the prayer book in Don Justino's left hand, where his finger marks his place, as if someone had just entered his study. His right hand, which is more three-dimensional, rests on but outside the chair arm, testing the boundary between the sitter and the viewer. Finally, Don Justino's dog, a perro inglese (possibly a pug) sits in the right foreground, its back to the viewer, looking up to his master. Murillo specifically included the animal, not just for verismo and its obvious appeal, but also to express his own loyalty and devotion to his friend. Murillo did not usually sign or date his paintings, but in this portrait, he was unequivocal; he inscribed, signed and dated it to the left above Don Justino's head on a panel beneath his coat of arms. Murillo's closest friend throughout much of his life, Don Justino owned at least eighteen of his paintings, and was one of the executors of his will. When Don Justino himself died in 1685, only three years after Murillo, he bequeathed his portrait and the magnificent Immaculate Conception (1678) to the Venerables Sacredotes. This is one of eleven canvases commissioned for the Hospital de la Caridad in Seville. Founded in 1662, by Miguel de Mañara, the Hospital represented a new direction for the Brotherhood of Charity, whose former raison d'etre had been to bury the dead. To complement and relate to the main altar's Entombment of Christ, elaborately sculpted by Pedro Roldán, Murillo, who was actually a member of this Brotherhood, painted six large canvases, each illustrating the other Acts of Mercy (Burying the Dead having been embodied by Roldán). Two of Murillo's paintings remain in the church, but the other four, including the present work, were looted in 1810 by Napoleon's Marshal Soult, and are now in various foreign museums. Murillo took his inspiration for Visiting the Sick, from the New Testament (John, V, 2), which describes the pool at Bethesda visited regularly by angels who sanctified the waters, recharging them with healing powers. One day when Christ came to the pool a sick man lying upon a pallet complained that no matter how hard he tried, he could never reach its waters to be healed. Christ said to the man, simply, "Rise, take up thy bed, and walk", and the man, cured, did. Murillo's Acts of Mercy cycle was an unqualified success, but the present work was singled out for his audacious use of architecture. The Gospel states that the pool was surrounded by five porches, which Murillo included not only to follow scripture, but also because they established a necessary level of depth separating the real and the miraculous, a distinction he emphasised further with silvery tones and diffused forms. In high contrast to the dreamlike background, Christ and his three Apostles loom tangibly in the foreground. Moreover, he painted the paralysed man at their feet from a slightly lower perspective that places the viewer alongside him, encouraging empathy with both his physical and spiritual weakness. "Taking the world as it exists, and the market as the standard, the best pictures by Murillo have sold, and will sell, for more than those of any artist, except Raphael." In 1883, when the American scholar C. B. Curtis made this claim, the highest known auction price ever achieved for a painting was the sum paid in 1852 by the French government for the Immaculate Conception of the Venerables Sacredotes the last version of Murillo's most celebrated religious subject. Murillo painted around two dozen Immaculate Conceptions, possibly more than any other Spanish painter of his time; he is even credited with creating a new iconography for this subject. Using the traditional composition of an Assumption, he got rid of redundant attributes, added the Apocalyptic crescent moon and a squadron of cherubs, and dressed the Virgin in a simple blue and white costume with a mandorla, her hands crossed at the chest, and eyes lifted to Heaven. Murillo became recognized as the master of this particular subject, but the present work differs from earlier versions in its determined sense of upward movement, and the absence of any virginal attributes. He may have deliberately omitted these objects (the tower of David, sealed fountain, palm and cypress trees, books, lilies, etc.) because he knew the painting would carry an elaborately carved frame featuring these attributes. However, it is also possible that this frame was made specifically to provide symbolism found lacking in the painting. This frame remains in the Hospital de Venerable Sacredotes in Seville, but the painting is now in the Prado. Following Church debates in 1616, the Immaculate Conception grew into one of Seville's genuinely local subjects, and ultimately became synonymous with Murillo. Often confused with the idea of virgin birth, the Immaculate Conception contends that Mary herself was born without the stain of original sin, making her intrinsically holy. In the Spanish Church, particularly in Seville, this was far more than some splinter belief; one actually had to swear a vow of Conceptionist faith to belong to a guild, or municipal corporation.